"Cultivators of the earth are the most valuable citizens. They are the most vigorous, the most independent, the most virtuous and they are tied to their country and wedded to its liberty and interests by the most lasting bands." These words of Thomas Jefferson describe the vast majority of patriots who fought in the American Revolution. They worked small hardscrabble farms, many carved by hand out of an unrelenting wilderness. Today it is difficult to understand what a mammoth effort it was to live off the land in colonial times. But as these men went to war against the British, their knowledge of the land and its plants played a vital role in the birth of our nation. 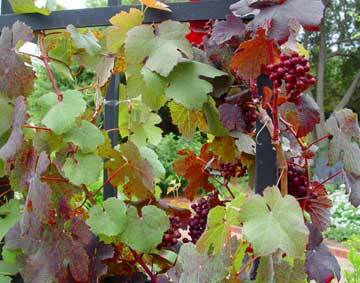 among the best foragers for edible fruits and berries. 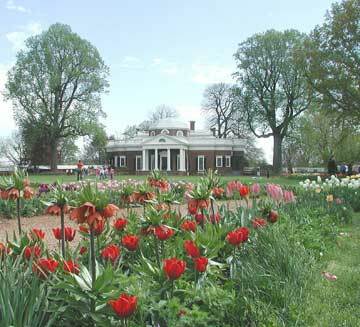 The Revolutionary War soldier rarely came from such large plantations as Thomas Jefferson's famous Virginia home. Yarrow came to the New World with English colonists. 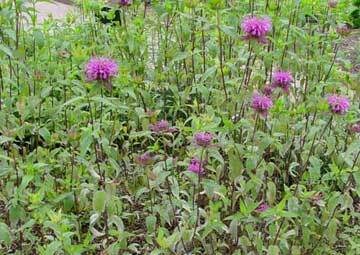 The Oswego tribe of New York used monarda for tea, which was adopted by many colonists after the Boston Tea Party. 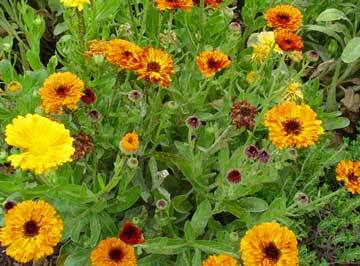 The petals of the calendula pot marigold were age-old battlefield dressings when cloth and cotton were unavailable. The patriotic garden, as you see, is far more than merely a collection of red, white and blue flowers. It is a testament to survival in the wilderness. And while Jefferson grew a huge range of plants at his plantation, Monticello, it was a far cry from the world of the soldier-farmer. These soldier-farmers and their families held generations of accumulated knowledge, some inherited from their British ancestors and still more gleaned from Native Americans. This knowledge of wild and useful plants recognized by every hunter-gatherer came into play as starving soldiers foraged through the countryside. Certainly, battlefield plants were vital to surviving skirmishes with Redcoats. Herbs with antibacterial and coagulant properties were hoarded for the inevitable flood of the wounded. Three coagulants came out of rural farm gardens, brought from the Old World as a living medicine chest. 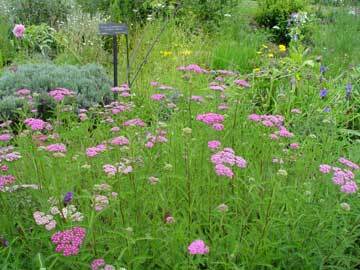 Yarrow, a European herb named for Achilles, has been carried into battle since ancient Greece. Periwinkle (Vinca major), also brought to America as a medicinal plant, was similarly valued for its ability to help staunch the flow of blood. Marigold (Calendula officinalis) was used as an antiseptic field dressing, and was still in use as late as World War I. These farmer-soldiers also knew which plants yielded food and in which season. Sallet and other pot greens offered foliage that could be eaten. But, more importantly, the knowledge of plants that did not make good pot herbs was invaluable. (British soldiers foraging in the Jamestown colony so poisoned themselves with datura that it was forever called Jimson weed.) Many other pot herbs were unpalatable in their raw form, but quite tasty when stewed. It was known that a diet required a range of foodstuffs in order to avoid symptoms of unpleasant vitamin deficiency such as scurvy. A majority of these plants are today considered mere weeds, but to knowledgeable foraging armies they were the essence of life. Succulent purslane, relished by Henry David Thoreau, already was well-known in colonial times. This plant was eaten fresh as a salad or stewed. The tender young leaves of wild dock, a close relative to common sorrel of England, made their way into soldiers' stew pots. Dandelion would be the first greens to emerge following the bitter winter at Valley Forge, serving as a vitamin-rich spring tonic whether fresh or stewed. Even nettle was a favored pot herb. Fruits held into the lean seasons fed the soldier with a sharp eye for plants. Wild rose hips, crabapples, elder, wild plums and many small berries tossed into the stew pot could add flavor, sugar and fiber. With coffee and tea worth their weight in gold, soldiers sought out alternative plants to flavor their hot winter drinks. Oswego tea, a New York native herb known as bee balm or Monarda didyma, became a colonial favorite after the Boston Tea Party. Chicory also naturalized throughout New England. The manicured gardens of Williamsburg or the flag-colored "patriotic" flower gardens of today offer few links to the valiant struggles of the American Revolution. Our truest patriot gardens are a collection of the native and the introduced, the ragged and the cultivated. But, most of all, they express the ingenuity and resourcefulness of a people who fought for independence from tyranny.